Mark Nolan started Nolan Oils in December 1988 so last month saw Oxfordshire's largest independent fuel distributor, celebrate its 21st birthday. 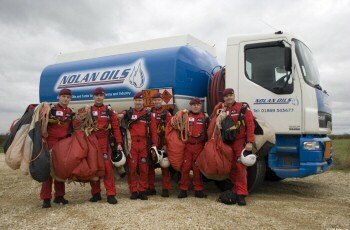 Celebrations actually started in late November when the Red Devils parachute team jumped into a Nolan Oils sponsored charity event. The event was attended by customers, friends and family to fundraise for Help for Heroes, a charity which the company supports in conjunction with the Bicester Round Table. Forty years ago Mark's parents Bert and Margaret opened a small petrol garage on the family home's front drive in Launton. As business grew, Bert started selling blue paraffin, becoming an agent for Gulf Oil and then after seeing an advertisement for Ultramar Golden Eagle, he became the company's first UK appointed distributor and started Markim Fuels. Mark joined his parents but after Kuwait Petroleum acquired Ultramar Golden Eagle and his father retired, Mark formed Nolan Oils. Mark reflects: “The 1970s saw rapid growth, they were a golden age for distributors. It's very different today and highly competitive. Nevertheless, we keep growing with the emphasis on customer service with a keen price." 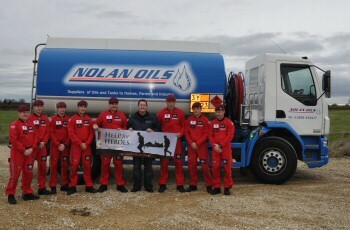 Nolan Oils began in a temporary storage facility at a wood yard near Bicester, with just three 12,000 gallon tanks for kerosene, gas oil and derv. (The company's storage has since increased to almost 600,000 litres.) Initially, Mark drove his one and only four wheel tanker himself but soon became too busy to do the work alone. By April 1989 there was an additional six wheeler, another driver and an accounts lady and, in 1995 a permanent site at a transport yard three miles from Bicester was acquired. Building work completed, the Middleton Stoney depot opened on 23 May 1996 for the supply of home heating fuel, diesels, lubricants and oil storage tanks and still operates from here today. Mark said: "Today's operation still hinges on a tightly knit team which now includes my sons, 19-year old Luke and Ryan,18. Business continues to go in the right direction, with an annual volume of more than 15 million litres, generated from a customer base within a 30 mile radius."